How does your home become part of your family session and what does it mean to coordinate your session to your home? We’ll take your decor and use it as a starting point to create a set of images that showcases your relationships as well as your home. During our pre-consult phone call I’ll ask you lots of questions about your style and what colors you are drawn to. Some clients even text or e-mail me pictures of the rooms we are going to use for the session. I can also make recommendations on what to wear. 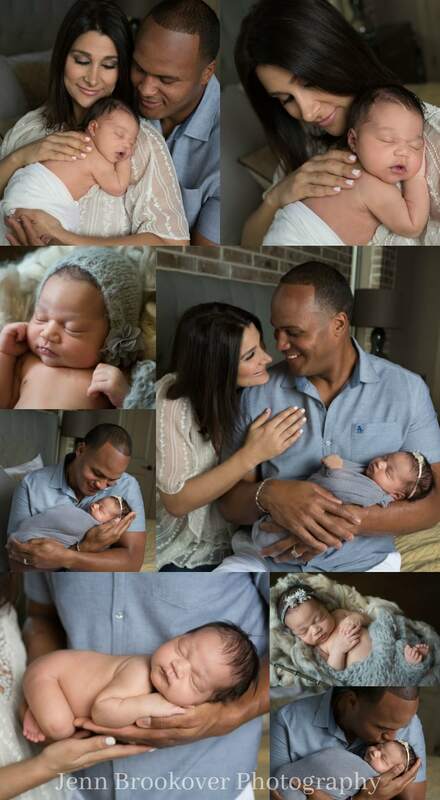 The results are a stunning array of images that not only capture the love and sweetness of your growing family, but are literally one of kind! They’ll also look great hanging right there where we took them! And, if you fall in love with one of my albums, we can customize the cover to match everything. Match your master bedding. The master bedroom is almost always a good spot for photos as the bed is large enough for everyone to cuddle on and it usually has a lot of great pillows to serve as the background. We can even borrow items from around the house (small flower arrangements or alternate lamps) to style the image a bit. Base your colors on the nursery. You’ve worked hard putting it together (or maybe it’s not put together but it will be at some point! ), it can be the perfect spot for your portrait session. Nursery’s also usually have good natural light (if not, we can pop up some quick lights). Some clients prefer more natural images which we can still coordinate by focusing on the base color (gray, cream or white). Stay classic. You want these photos to last forever! By choosing solid (or a slight pattern) clothing in coordinating (but not match-y) colors you’ll create memories the focus on the people and not what you have on.